The Mini Rickshaw is the hip new mobility scooter for those to get around town. The Mini Rickshaw is small in stature, but packs a punch with its 48V 12AH battery pack. Choose from our cool new two tone colours to add flair to your unit. With its halo LED headlights, make sure you can see ahead of you whenever you go out. 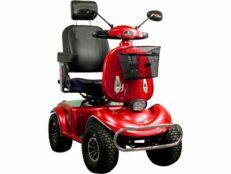 It’s removable seat and foldable tiller allow it to be transported if you’re going out of town. Other features include, turn signals, brake lights, 3 speed switch and more. Get the Mini Rickshaw 48V today.